In 1913 a âSee America Firstâ? travel campaign captured the imagination of new car owners, and hot on the trail of the trend, the California-based editors of âMotoringâ? magazine recommended that readers âsee Half Moon Bay firstâ?. What they called the âKings Mountain to Half Moon Bayâ? tour caught on quickly. âMotoringâ? advised âcamera fiendsâ? to brings rolls of film to capture âthe picture primeval and beautiful, as it is restless and wild.â? Clutching the steering wheel of the latest model Kissel Kar, the driver and his party of motor enthusiasts sampled the much talked about 1-day tour from Kings Mountain to Half Moon Bay. 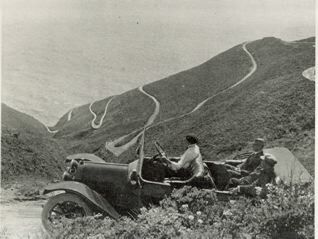 For the jaunty motorists in the Kissel Kar, the Kings Mountain âroadâ? resembled not a rocky brown trail but rather verses from an 18th century poem: âa long green lane canopied overhead with interlacing boughs.â? Traveling west over Tunitas Creek Road, they paused to contemplate an abandoned sawmill, overgrown with ferns. 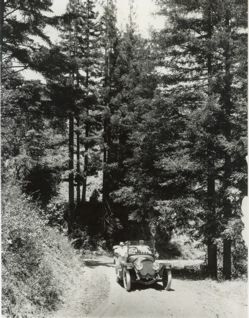 The Kissel Kar passed through the shadow-filled canyons bordered with vibrant green ferns and Redwood trees. The canyons opened up as the Pacific Ocean and the rolling hills came into view. The air felt cooler and the color of the landscape changed from green to earthy brown tones. 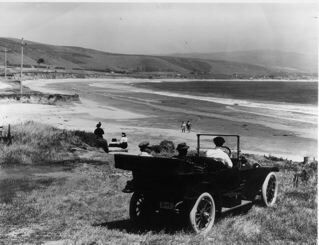 The new Kissel Kar swung north toward Half Moon Bayâthen better known as âSpanishtownâ?. The townâs mood was sleepy, compared with the wheeling and dealing that had dominated the area during the Ocean Shore Railroad real estate boom. But when the automobile continued heading north to enjoy the spectacular views from Pedro Mountain Road near Montaraâthe editors of âMotoringâ? magazine discouraged readers from following in their tire tracks. âEven with a thoroughly reliable driver and trustworthy car,â? advised the magazine, âPedro Mountain road is in such poor condition that anyone going this way is simply inviting disaster.â? Underscoring the danger was a large sign that read: âDANGEROUS FOR AUTOMOBILESâTAKE ROAD VIA SAN MATEOâ? If they chose to ignore this sign, motorists encountered grades as steep as 25 percent in some places. The hairpin turns called for âthe coolest heads, firmest hands and strongest brakes that a car can have.â? 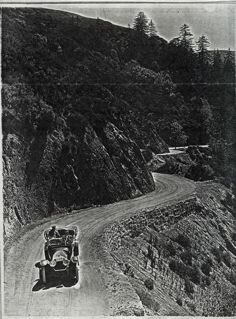 But while the driver and his passengers in the Kissel Kar warned others not to drive Pedro Mountain Road, they took the risksâand as a result, we can enjoy the photographs they took more than 90 years ago.